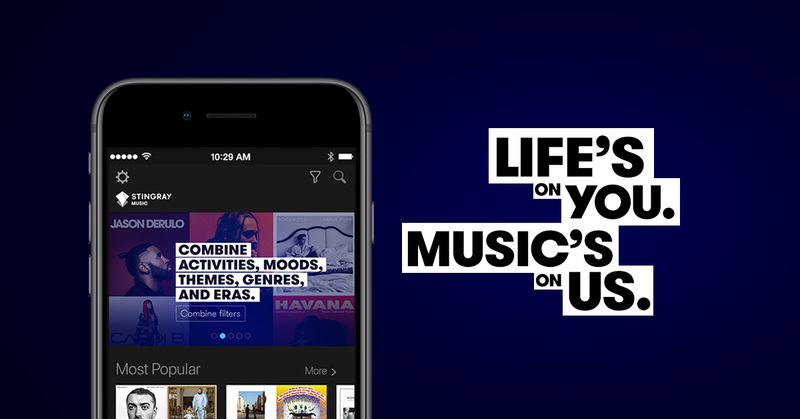 Your favorite music is now more easily accessible than ever! - Over 5 billion mobile subscribers – about 77% of the world’s population – are online. - Steaming music online has caught on in part thanks to the staggering amount of smartphone owners who listen using on their phone. - In the US, 55% listen to the radio or stream content online, compared to 49% in Canada. Once the mobile app is paired with their television, cable customers have access to their favorite Stingray Music audio channels (using the same channel numbers as on TV) and music preferences (for subscribers with access to the TV App). The app has been developed to offer a seamless and intuitive user experience. Now. imagine that every time users unlock their phones to play music, they see your brand. The improved Stingray Music mobile app reinforces the connection between telcos and customers; underlining the added value that YOU are providing. In this new design, your brand will appear on every page throughout the app. We’ve redesigned the interface to give intuitive and upfront access to new releases, celebrity guest curators, and exclusive content. There is no longer a need to search subcategories or click more in-depth into the app. We’ve also placed each listener’s history, and personalized recommendations - based on user likes and blocks – on the homepage. Moreover, finding your “vibe” at any time of the day is easier than ever thanks to the funnel icon that allows users to combine up to 3 filters in the Activity, Mood, Theme, Genre, and Era categories, and explore more channels curated for all of life’s moments. February 2018, Edison Research national telephone survey.